You Don’t Have the Muscle: This is no slight on your work-out efforts, but more a realistic approach to getting rid of your junk. Some items like a sofa, old fridge or hunks of patio concrete simply need more than one person to lift and load. Sure you can try to be “Superman” and do the job yourself but do you really want to risk throwing out your back? You don’t have to if you hire experienced movers like Junk King KC. You Don’t Have A Big Enough Truck: Depending on how much junk you have, you might just need a very big truck. Even if you have your own pick-up you have to consider if that will be enough space. What is the alternative? Making several trips back and forth to the dump? With professional junk haulers its one trip and you don’t have to make it at all! You Don’t Have the Time: Hopefully, you’re the type of person who has taken the advice to “get a life” to heart. This means your weekends are full of activities. Even if you do have a rare weekend off from a hectic work week do you really want to spend it hauling junk? Probably not. The junk haulers you hire can show up first thing Saturday morning and be done with the job in time for you to head off to brunch! That’s going to be the start of a perfect weekend. You Don’t Want to Create an Eyesore: If you’ve got junk piling up in your front or back yard you could be getting the “stink eye” from your neighbors. Can you blame them? 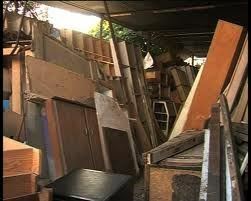 Put aside your indignity for a moment and think about what goes through your head when you see some yard full of junk. Don’t you think, “They should clean that up.” Well, now is your chance to reduce the risk of an eyesore by getting rid of all your junk once and for all. You Don’t Want to Mess Up the Environment: If you choose Junk King KC, you could end up having a large percentage of your junk diverted to a recycling center as opposed to a local landfill. Any time you can sidetrack garbage to recycling is going to result in cleaner air and water for everyone. Add it all up and those are great reasons for hiring Junk King Kansas City! This entry was posted in junk king kansas city, Kansas City Furniture Pickup, kansas city hauling, Kansas City Junk Recycling, kansas city junk removal, Kansas City Trash Pickup, KC Junk Removal and tagged Get Rid of Junk KC, kansas city hauling, Kansas City Junk Haulers, kansas city junk removal on September 29, 2011 by Mike Stroud. Last updated August 2, 2017 .